The report, released May 8 by the Environmental Investigation Agency, detailed how corrupt government officials in Vietnam are helping to funnel millions of dollars in illegal timber from Cambodia into Vietnam. Vietnam imports an average of 4.5 million cubic meters of roughly 150 different species of wood from over 100 countries. In the midst of an agreement with the EU to ensure the source of its timber is legal, Vietnam is now under tremendous scrutiny. HO CHI MINH CITY, Vietnam – After several weeks of silence, the Vietnamese government announced that it is working to begin an investigation into allegations of widespread illegal logging in Cambodia directed by Vietnamese companies and provincial government officials. 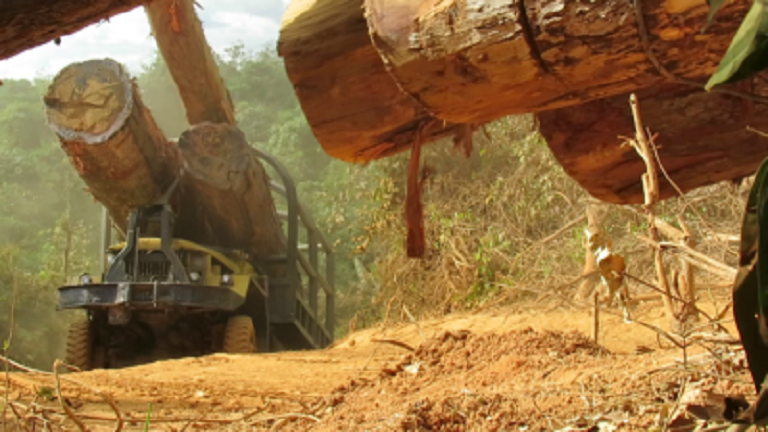 Earlier this month the Environmental Investigation Agency (EIA) released a damning report which detailed mass-scale illegal logging in Cambodian national parks, as well as the importation of this unlicensed timber into Vietnam’s Central Highlands. In addition to the report, the organization has released an online library of documents in Vietnamese and satellite images detailing the smuggling operation. In the weeks immediately after the undercover investigation went public, little was done to rectify the situation. However several sources have shared with Mongabay that last week, Vietnam finally announced that it was looking into the issue. Phuc Xuan Tho, a program analyst at the international NGO Forest Trends, told Mongabay in an email that the Ministry of Agriculture and Rural Development (MARD) had informed him of the investigation, but did not provide details on its breadth or depth. Nguyen Van Ha, deputy director general of the Administration of Forestry under MARD, explained that the ministry has sent a report to Prime Minister Nguyen Xuan Phuc asking him to assign the organization to conduct a full investigation into the report’s allegations. Ha says they are still waiting for a response. Phuc is currently in the United States on an official visit to Washington D.C.
Arevs in O’Tabok, Virachey National Park, Cambodia Feb 2017. Photo courtesy of EIA. Meanwhile Thanh Hoang, a program manager for the EU’s delegation to Vietnam, said that the illegal logging scandal was discussed at recent negotiations on clean timber between the EU and Vietnam in Brussels. The reaction to the report, which was released on May 8, was especially slow from the Vietnamese side. Prior to the announcement of an investigation, Jago Wadley, senior campaigner at the London-based EIA, said he believed that the response from both the Vietnamese and Cambodia governments had been inadequate. Meanwhile Say Sam Al, Cambodia’s environment minister, told the Cambodia Daily on May 15 that the government was investigating the information in the report, and had been looking into related allegations over the past year. “Some of the claims are new,” he told the paper, while declining to go into further detail. This raises questions of how Cambodian officials could have allowed for 300,000 cubic meters of timber to be illegally moved into Vietnam if they were already investigating such actions. Phuc, from Forest Trends, believes there may be a reason why it took so long for the Vietnamese side to respond. “The officials who are responsible for this issue [were] in Brussels for the FLEGT negotiations,” he said via Skype. “The heads of the various departments of the administration of forests [were] in Europe, so they [were] not in the position to respond to the report yet.” FLEGT refers to the Forest Law Enforcement, Governance and Trade which houses the Voluntary Partnership Agreement (VPA) which Vietnam and the European Union signed on May 11. Under this pact, Vietnam must ensure that all timber exports from the country are derived from legal sources. The presence of Vietnamese officials in Brussels highlights the global importance of the nation’s wood processing industry, worth $7.3 billion in 2016, and the EIA’s evidence of illegal logging. The release of the report just days before representatives from both parties initialed the VPA placed pressure on the EU to respond. George Edgar, the EU ambassador to Cambodia, said they hope to see an investigation. “We strongly encourage the authorities of Cambodia and Vietnam to urgently investigate the reported illegal activities and take firm action against individuals and companies found to be involved in illegal logging, and to take steps to prevent any such activity in the future,” Edgar said in a statement sent to Mongabay. Representatives of the EU’s negotiating team in Vietnam couldn’t be reached for comment by publication. Some experts believe the agreement between Vietnam and the European bloc will place increased pressure on the former to clean up its act. Wadley, from the EIA, says the EU must maintain pressure on Vietnam to prevent future illegal logging. “It needs to stay firm in its goal of ensuring the FLEGT VPA negotiations and help Vietnam clean up its timber sector through fundamental legal reforms and enforcement,” he said. A major obstacle to outside pressure, however, is the central Vietnamese government’s lax control over certain activities of provincial governments. 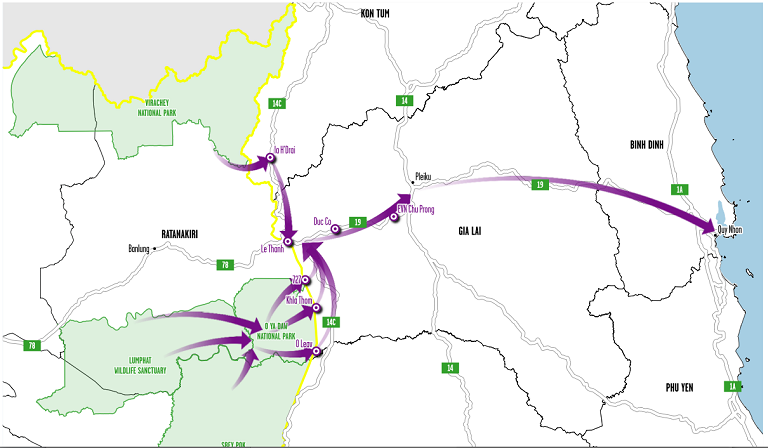 The route of illegal timber from forests in Cambodia to the Vietnamese port city of Quy Nhon, a major wood processing center, via EIA. Therefore officials in Gia Lai, or any province with secondary border crossings, can use them as they please without seeking permission from Hanoi. In April, before the release of the EIA report, several officials from the central government visited Gia Lai to warn of the danger of loose border control. Lao Dong, one of Vietnam’s national newspapers, reported on April 13 that Phan Dinh Trac, head of the Central Party Department of Internal Affairs, expressed concern that Gia Lai’s policy of allowing for the import of 300,000 cubic meters of timber would negatively affect border security. Nonetheless, as evidenced by EIA the importation of illegal timber has continued apace. Fragmented government oversight is just one challenge facing Vietnam’s wood processing industry and its international customers. Another huge obstacle, according to Phuc, is the wide variety of sources which provide Vietnam with its timber. Since a blanket ban on logging natural forests within Vietnam is in place, wood processors must look elsewhere for supplies. Phuc explains that Vietnam imports an average of 4.5 million cubic meters of roughly 150 different species of wood from over 100 countries. Controlling such a varied import process is extremely difficult. 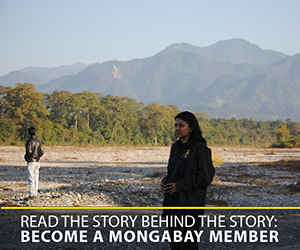 “Under the VPA a mechanism for controlling timber imports will be developed, but we can see how challenging that is on the ground with such a huge volume of timber imported and the huge number of species and sources,” he said. Australia provides a good case study of the difficulty associated with imported wood products from Vietnam. According to ABC, Australia imported $225 million worth of timber products from the Southeast Asian nation. In February the Australian Department of Agriculture and Water Resources reported that only 35 percent of the 512 largest importers in the country complied with due diligence requirements, and only 8 percent of furniture imports came from certified timber. 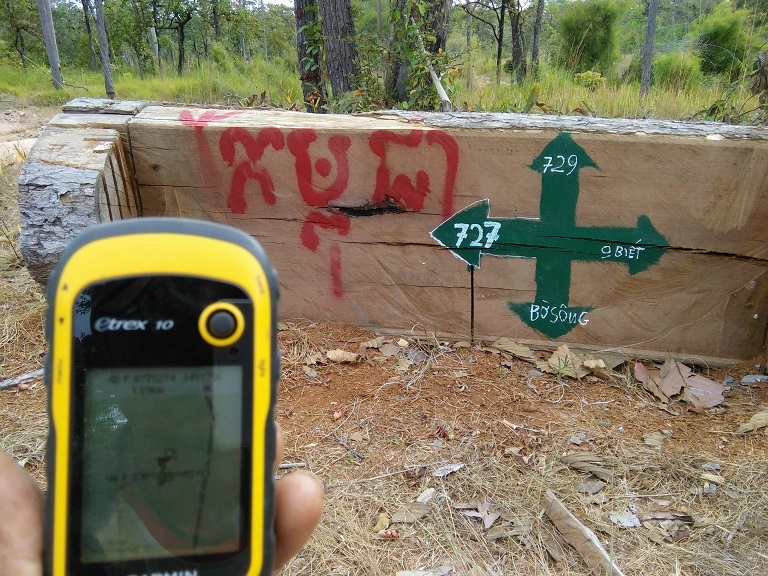 A sign directs logging trucks to timber depots set up along the Vietnamese border with Cambodia. Photo courtesy of EIA. The Vietnamese government has set a goal of creating clean timber certificates for wood manufacturers by 2021, but Phuc is doubtful that they will meet this deadline. Wood processors in the country will only be able to receive FLEGT licenses once both the EU and Vietnam agree on the strength of the new timber legality assurance system. The Alliance of Leading Environmental Researchers and Thinkers (ALERT) recently asked in an editorial whether it was time for an international boycott of wood products produced in Vietnam. Banner image: A sign directs logging trucks to timber depots set up along the Vietnamese border with Cambodia. Photo courtesy of EIA.